A couple with a love of modern design and a devotion to Michigan’s natural beauty harmonizes the two in this Cross Village home. 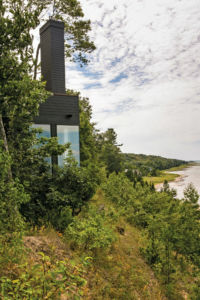 This home is featured in the June 2014 issue of Northern Home & Cottage, a bi-monthly home publication included in all subscriptions to Traverse, Northern Michigan’s Magazine. Subscribe! 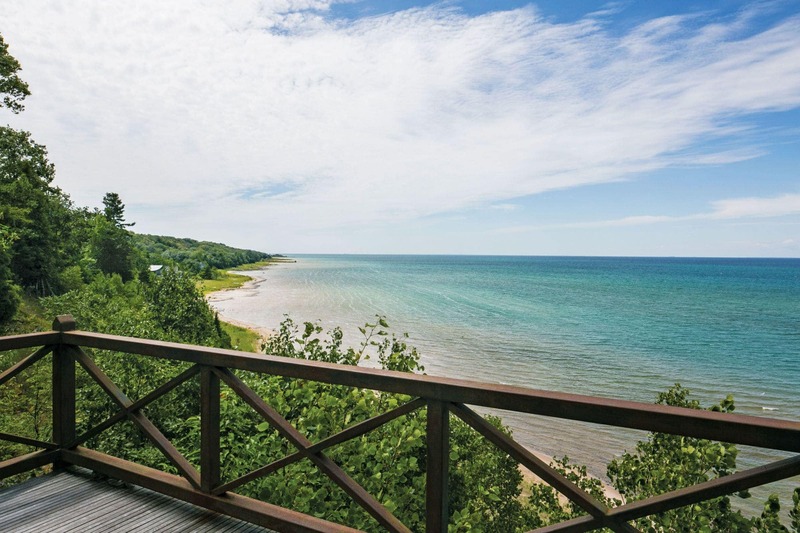 Ask any Northern Michigan real estate pro, and they’ll tell you that the market is recovering. Homes and cottages are selling faster, for higher prices. 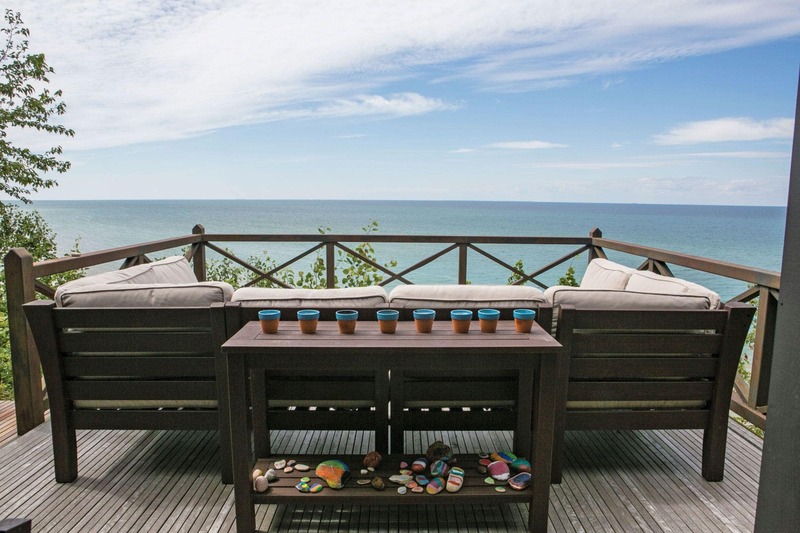 Just a few years ago, though, listings were plentiful and bargains easy to find, even for the kind of prime lakefront properties people dream about. Serious buyers were scarce but savvy, and now, as demand and values climb, they are happy to count themselves among the few who “got in” at the perfect time. Most weekends, you can find one such couple enjoying their modern bluff-side getaway near Cross Village. Jessica Woll, a Detroit-area family law attorney, and her husband, Don Stewart, an executive at Chrysler, combined good timing with keen vision when they purchased the then-unfinished house in 2008. The 6,000-square-foot structure had sat in a skeletal state for about two years, due to the recession. 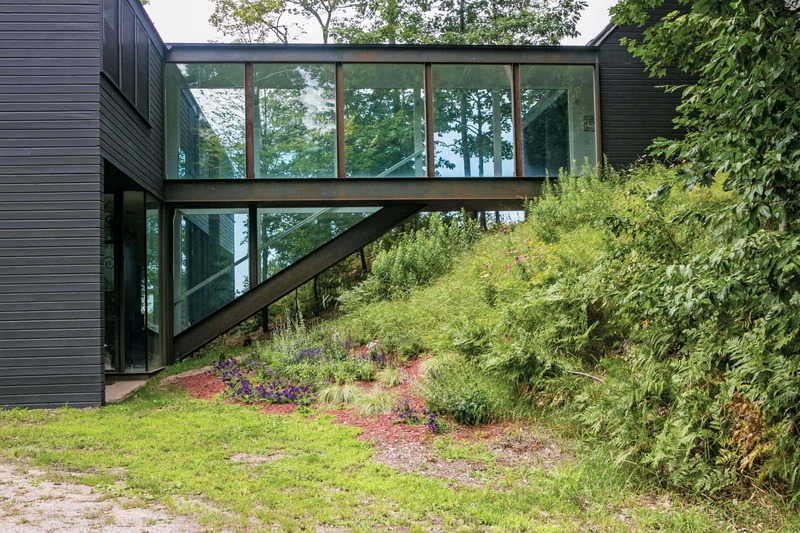 Jessica and Don were drawn to the home’s geometric shape and modern sensibility as well as its woodsy site on Sturgeon Bay, near where they had vacationed for many years. When they finished the house, they maintained its original personality, enhancing it for their own needs. Jessica and Don love modern design, and they wanted a unique Up North home in a private, natural setting. Respecting the land was important to them, and the home’s gentle footprint is certified by LEED (Leadership in Energy and Environmental Design). The certification was achieved through careful siting, geothermal heating and cooling, and selection of eco-friendly materials. 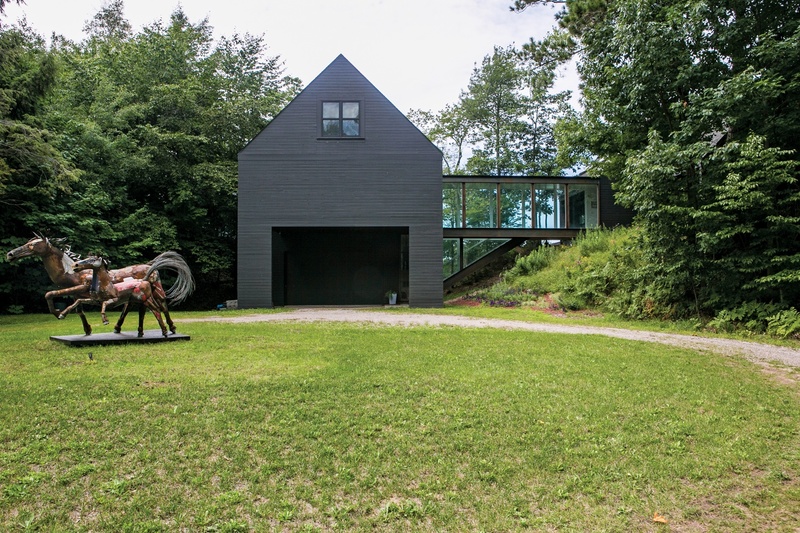 The landscaping on the 3½-acre site is very minimal, and the dark exterior color scheme of the home helps it blend into the mature trees. “We’re more cognizant of the environment [Up North] because the natural beauty is right there in front of us,” Jessica says. Inside the house, Lake Michigan is visible from nearly every room. The cantilevered master bedroom with floor-to-ceiling glass seems to float over the waves. Jessica sometimes wakes up to see eagles searching the water for breakfast. “There’s an inside-out aspect to every space,” says Jessica. This design feature is especially welcome when large groups gather here. The five-bedroom, five-and-one-half–bathroom house is often full of family and friends enjoying all that Cross Village and Harbor Springs have to offer, all year long. That includes skiing at Boyne Highlands, biking through the beloved Tunnel of Trees on M-119 and, of course, running down the zigzagging staircase with a sun-dried towel to hit the beach. Jessica also loves art and indulges that interest with her 8-year-old daughter, India, at Three Pines Studio in Cross Village. The gallery and studio hold workshops for all ages and sells local fine art and crafts. It’s where she purchased an unusual tribute to India’s equestrian hobby: a life-sized, recycled-metal sculpture of two horses by Boyne City artist Doug Melvin. The piece greets visitors in the front yard. Personal touches like this stand out against the minimal look of the home. The minimalism has a cottagey counterpoint, though, with glossy-white beadboard hung horizontally throughout the house. In the kitchen, the beadboard plays off Shaker-style cabinetry, a custom-made modular table and a kilim rug over ipe flooring. The result is a distinctly original look that’s warm but still clean and modern. The family has been enjoying the retreat for several years now. They have thoughts of expanding, maybe adding a pool for the shoulder seasons. Timing was all-important in the beginning, but now when the family arrives Up North, all the pressure is off. It’s the perfect place to take in the views and the fresh air blowing across Sturgeon Bay.